Other photos: Photo 1, Sunseeker Predator 82, Photo 3, Photo 4, Sunseeker Predator 82, Sunseeker Predator 82, Photo 7, Photo 8, Photo 9, Photo 10, Photo 11, Photo 12, Photo 13, Photo 14, Sunseeker Predator 82, Photo 16, Photo 17, Photo 18, Photo 19, Photo 20, Photo 21, Photo 22, Photo 23, Photo 24, Photo 25, Photo 26, Photo 27, Photo 28, Photo 29, Photo 30, Photo 31. 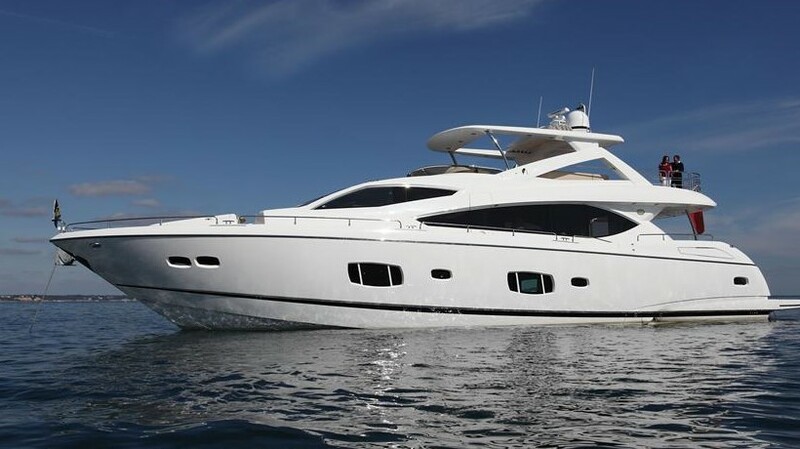 Built in 2006 by British yard Sunseeker, she is one of the most popular and comfortable model in this impetuous style. It brings together dynamic new design principles to offer more space and comfort than ever. The centerpiece has to be the hard-top on the upper deck, a unique rotating glass sunroof adding more light than ever. An impressive Predator 82 with a black hull and white superstructure making it a real head turner everywhere she goes. Its classical interior offers accommodation for eight guests in four staterooms, as well as a large salon and dining area with an opening sunroof. Every year maintained and regularly upgraded this is an excellent opportunity to acquire this luxury dashing sports yacht.